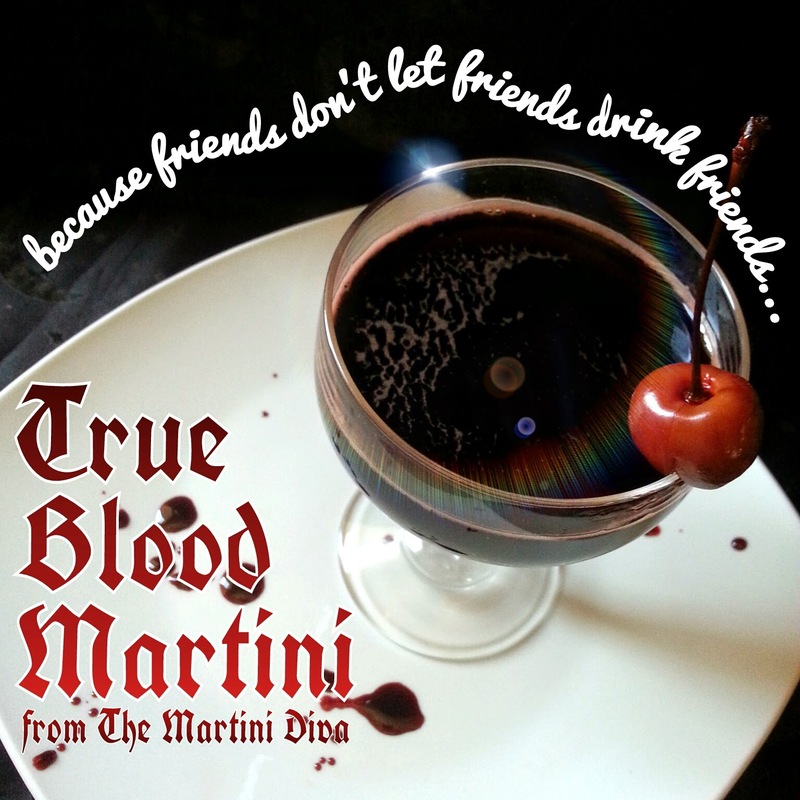 The True Bloodtini is a nice little bite of pomegranate in a blood red cherry and gin cocktail. 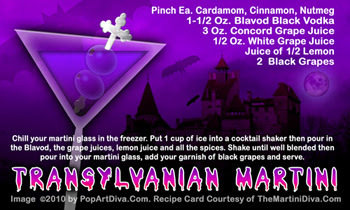 This deadly delicious concoction will have every vampire in your coven forsaking hemoglobin for the night. Serve it up with a wink and a nice, fangy smile. While many of the recipes call for the almond flavored Orgeat Syrup and a brandy, this recipe uses Creme de Almond and Grand Marnier instead. Just another of the many recipes that abounds for this little cocktail with a sting! 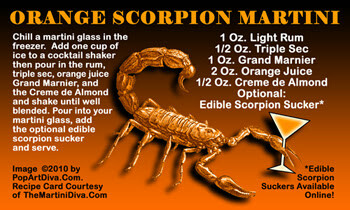 Scorpion Sucker as a garnish for this Halloween version - otherwise you're not scaring your party guests, you're taking them on a tropical vacation! The Monstrous Ritatini takes a timid margarita and moves it into the realm of monsters of epic proportions. A little bit of orange juice, a purple sugar rim and a monster of a gummy candy put the real boo in boo-zelicious and a good amount of spook in spooktacular for your Halloween celebration. 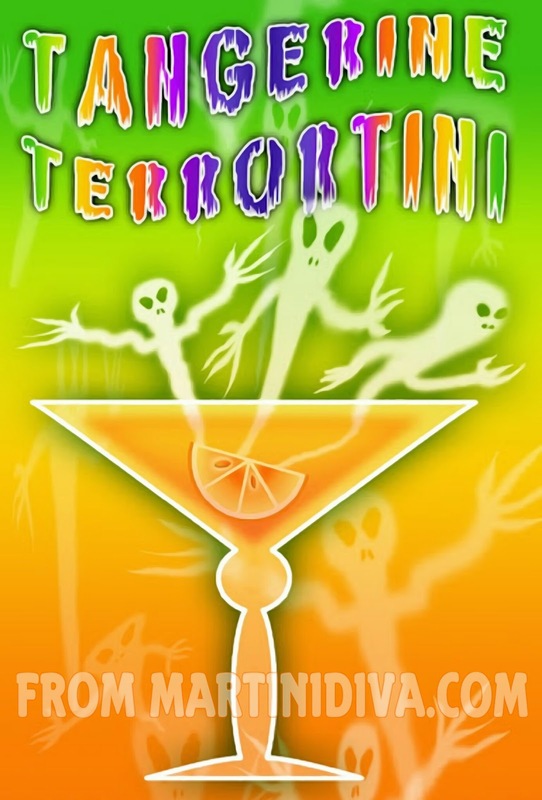 Double up the recipe and serve it up in a monstrously large martini glass and you'll have a libation that will mellow out any monster moods on All Hallow's Eve! 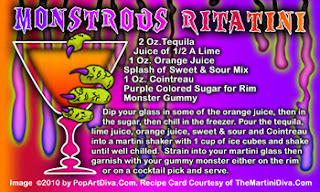 FREE, 5x3 recipe card for The Monstrous Ritatini in print quality HERE . 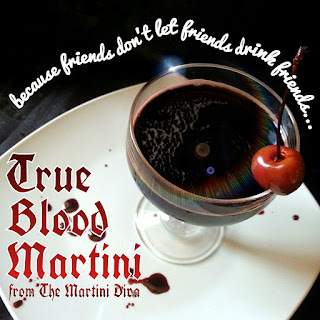 The Graveyard Sunrise Martini is another great cocktail that makes use of blood orange juice, one of my favorite mixers for Halloween because of the deep, red-orange color. This time I've made use of it in a Halloween variation of a classic Tequila Sunrise. 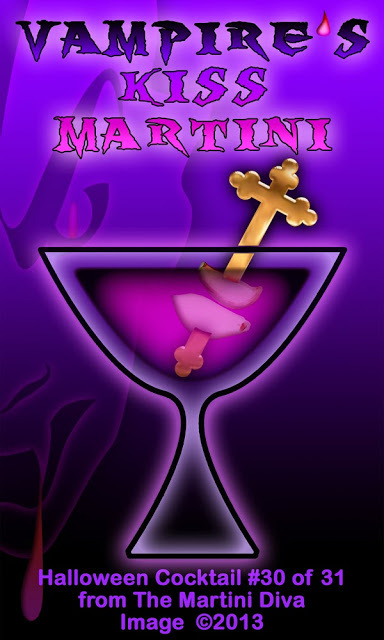 Not only is this a fun name for a Halloween martini, it's fun looking with a great layered look from the pomegranate syrup that settles to the bottom of your glass. 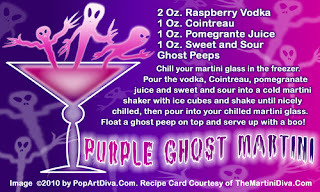 Be sure to follow the instructions on how to get the pomegranate syrup in so it settles to the bottom, it's weight is heavier than the orange juice and tequila so as long as you do it right the bottom of your Graveyard Sunrise Martini will glow like fire! 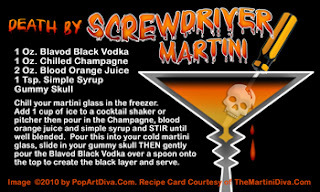 The Death by Screwdriver Martini is a layered cocktail of blood orange juice and black vodka that sparkles with a splash of Champagne. It's a classic Screwdriver (orange juice and vodka) taken up a scary notch for Halloween. The whole trick to the layering is to gently pour the Blavod black vodka over a spoon into your orange and Champagne martini AFTER you have added your skull garnish. It's tricky but when done right it's an impressive bit of Halloween magic! 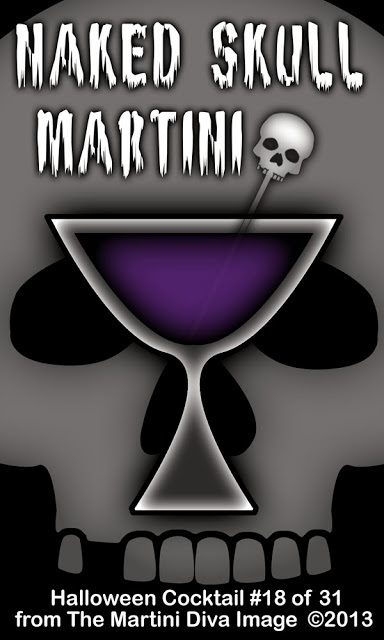 FREE, 5x3 recipe card for The Death by Screwdriver Martini in print quality HERE . 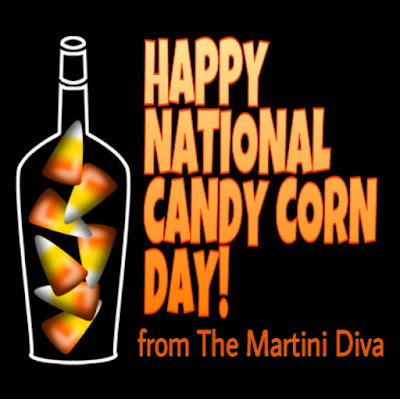 The Candy Corn Creeptini or Candy Corn Martini will have you taking taking another look at those classic little orange, yellow and white candies from your youth. Taking the vanilla flavor and bumping it up with some white chocolate liqueur and a healthy serving of orange juice, this is a monster sized cocktail that you'll need an extra large martini glass for . . . or you could simply pour it into two smaller cocktail glasses and share! 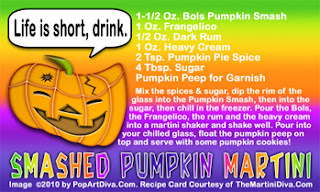 You can shake this all up together for a cocktail the color of a deep orange fall leaf or you can float the Blavod vodka on top for a layered orange and black beverage in true Halloween colors - but don't forget the all important garnish of the candy corn! IT'S NATIONAL CARAMEL APPLE DAY - Have yours in a martini glass! An interesting little tidbit about caramel apples is that if the caramel is dipped in peanuts or another ingredient it's is more properly referred to as a Taffy Apple! No matter what you call them, caramel dipped apples are classic fall treats and once were the prize of a Trick or Treat outing. If you came home with a "taffy" apple or caramel apple you figured it was a good Halloween haul that year! 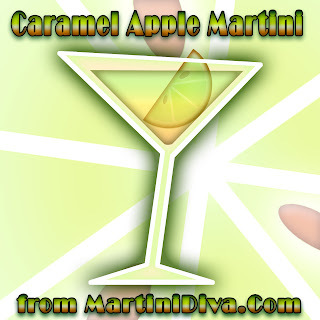 Here the classic flavors of a caramel apple come together in a martini glass for some nostalgic flavors for happy hour. The sweet, tartness of a Granny Smith or Fuji apple comes in the form of the apple pucker and the caramel gets shaken in with the Butterscotch schnapps mixing with the vodka and a pretty drizzle of caramel sauce swirling around the glass bowl, creating that classic caramel apple taste. Garnish with a caramel apple slice and you're back in childhood savoring this great blend of fall flavors. Apples contain high concentrations of pectin which helps to stabilize blood sugar levels. Apples stimulate the flow of saliva which aids in promoting good digestion. Eating a crisp apple helps to clean the teeth and stimulate gum tissue. Apples are rich in flavonoids, beta-carotene and vitamins, B, C and contain important minerals such as boron, calcium, phosphorus, potassium and silicon. 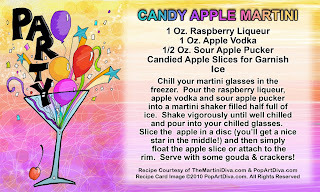 So, enjoy your Caramel Apple Martini and add a couple of extra caramel apples slices to the rim to keep the doctor away! HAPPY NATIONAL CARAMEL APPLE DAY. 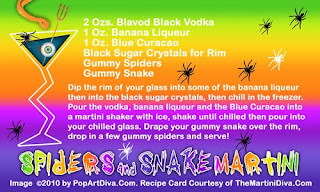 The Spiders and Snake Martini is a black banana martini, which is kind of ironic considering that spiders love bananas. There's actually a species called the Banana Spider or Brazilian Wandering Spider that loves to hang out around bananas and it's a pretty gruesome, venomous character with the reputation of being the world's deadliest spider. I suggest you garnish your martini with a harmless plastic spider. You want to scare your guests on Halloween, not kill them. . . .right? The dinosaur gives the bartender a long, complicated list of instructions for making the drink it wants. The bartender says, "And what'll you have?" 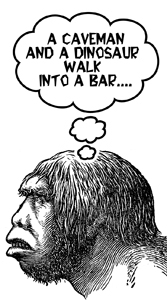 The caveman shrugs. "Just gimme something over the rocks." The ancient Egyptians loved their beer, Rome and Greece were awash in wine and even had gods designated to the enjoyment of alcohol. Bacchus (Rome) and Dionysus (Greece) were huge party animals! The oldest known recipe ever discovered is for beer! 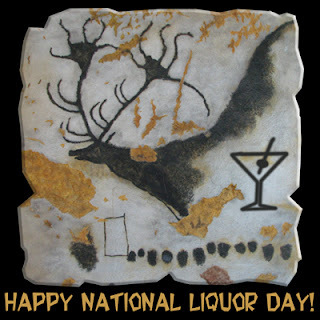 Yes, indeedy, booze has accompanied humanity on our journey through the eons and today we celebrate that long term partnership and love affair with it's very own holiday! 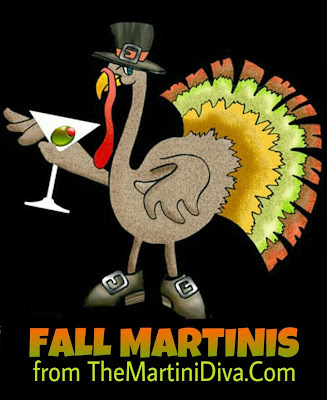 The Red Devil Appletini is a devilishly delicious drink that combines two fall favorite flavors - apple and cinnamon! The interesting thing about this cinnamon is it comes to the party with some bling of it's own. . .real gold! That's right, the Goldschlagger is a cinnamon liqueur with specks of gold floating in it. It's red hot, rich and, to make things even more devil may care, it comes with a lovely little bite of candied apple for the garnish. I don't really know if the Devil cares or not but I will tell you the Devil made me do it! 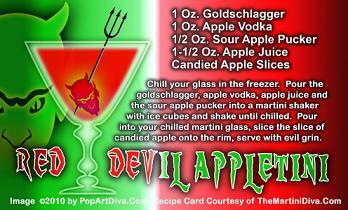 FREE, 5x3 recipe card for The Red Devil Appletini in print quality HERE . The Orange Ooze Martini gets it's name from the Grenadine syrup "blood" that drips down the sides of this orange colored and flavored cocktail. It's a triple dose of orange flavor with a scary little surprise floating on the cocktail pick of a gummy eyeball or skull. Feel free to use any oozy little gummy candy as your garnish - bugs and spiders are a nice oozy alternative to stick on your cocktail pick as well. 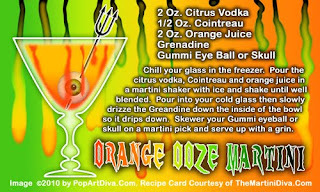 FREE, 5x3 recipe card for The Orange Ooze Martini in print quality HERE . 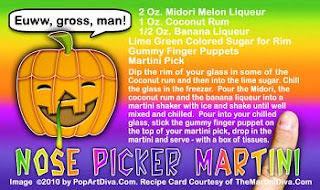 The Nose Picker Martini is a gross name for a pretty yummy coconut, melon and banana cocktail but it is Halloween after all and grossing people out is all part of the fun! I have always garnished it with some gross gummy finger puppets but if you can't find those I understand there is now gummy candy in a road kill theme! (Thank you, Laura!) Just about any icky type of garnish will do - you can even mold chocolate into fingers and use that as a garnish. Just have some grade school level fun with it all! 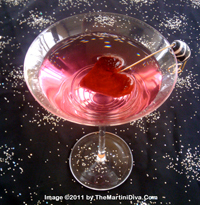 FREE, 5x3 recipe card for The Nose Picker Martini in print quality HERE . 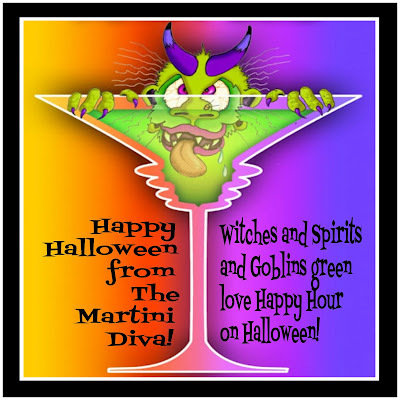 The Monster Mash Martini is a fun, green colored melon and pineapple martini that you garnish with monster gummy candies. This is my ode to my favorite Halloween song of all time, "The Monster Mash" by Bobby "Boris" Pickett & The Cryptkickers. The "Monster Mash" came out in 1962, right at the height of my Trick or Treating phase and during the era of the Mashed Potato dance craze. It was so popular that over the following years it was also performed or recorded by famous monster actors Boris Karloff (from 1965) and Vincent Price (in 1977) . Even the Beach Boys came out with a version (in 1964) and Ron Howard (Richie Cunningham) sang it on Happy Days (1978). Halloween cocktail #9 is the Gates of Hell Martini. 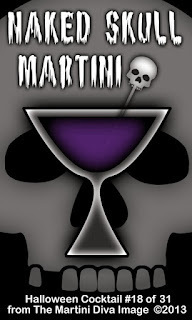 Hot as Hades from the hot chili peppers and pepper sauce, this evil martini will bring tears to your eyes - literally! 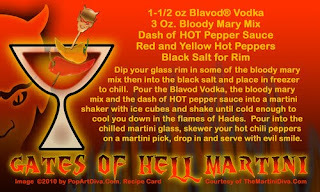 The Blavod black colored vodka deepens the Bloody Mary mix to a dark reddish orange and the hot peppers for garnish will bring forth a few Halloween howls from the unsuspecting. You can cool down or amp up the heat by your personal choice of hot sauce and peppers. To help you out in the pepper department, check out the heat levels of chili peppers on the Scoville Scale at Wikipedia.